Sure, you've had French fries, sweet potato fries and plantain fries, but have you ever tried cassava (yuca) fries? Have them one time, and you'll be hooked. Yucca fries are easy to make, and you can bread them before frying, but they're just as tasty fried au naturel. We prefer them as is. Compare these fries with Caribbean yuca chips. Peel cassava (yuca) and cut into 4-inch pieces, lengthwise. Add cassava to a pot, cover with water and bring to a boil. When the pot comes to a boil, season with salt to taste. Let cassava cook until fork tender. Drain cooked cassava well and let cool to handle. Cut cassava pieces in half and remove the stem in the middle. Cut the halved pieces into 1/2-inch strips. Heat oil in a deep pan until smoking hot. Working in batches, fry cassava pieces until they are gently browned. 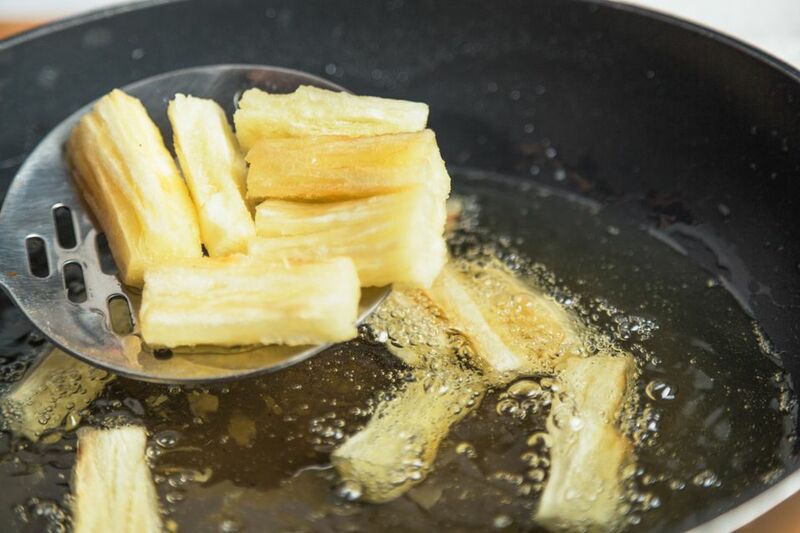 Using a slotted spoon, remove cassava fries from hot oil and let drain on paper toweling. Season with black pepper and a sprinkling of salt. Serve just as you would French fries.